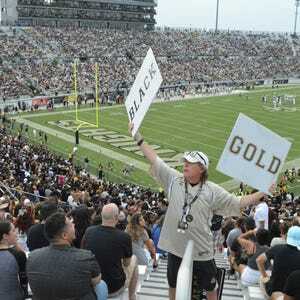 Sporting a UCF baseball cap and a Knights football T-shirt, Regis Kramer walked into Bright House Networks Stadium feeling the energy from a vivacious Homecoming crowd. The Marching Knights blasted UCF cadences as he stood a few yards away taking photos of his brother, Caleb, a trumpet player. It was at that moment he was no longer controlled by his condition. “When I first got diagnosed, I was like ‘Oh no. I’m not going to be able to go to UCF games,’” said Kramer, a 2011 UCF alumnus. A few months after purchasing season tickets to UCF’s 2015 campaign, Kramer was diagnosed with Stage II Hodgkin’s lymphoma, a form of cancer that affects part of the immune system and his chances of cheering on his alma mater. Since transferring to UCF in 2009, Kramer has been a huge supporter of Knights football and has attended nearly every game. Kramer’s doctors scheduled him for 12 treatments of chemo until February 2016, which prohibits him from being exposed to sunlight for extended periods of time. Not wanting to miss what he thought was the most important game of the season, Kramer made a phone call to UCF Athletics requesting a shaded seat for the Homecoming game on Oct. 29. But after explaining his situation, the program was inspired to do more for the fan. “We didn’t know what to expect until we got there. They told us to show up in the morning, and they took Regis aside to surprise him,” said Ashlee Bush, Kramer’s girlfriend who accompanied him to the game. The pair was given VIP access to the Carl Black and Gold Cabana for a 4 Rivers lunch and a chance to watch the game from the athletics director’s suite and on the field. That day externalized Kramer’s faithful perspective on life. Serving as a full-time media director and assistant director for the children’s ministry at First Baptist Church in Weston and the leader of first priority at Tequesta Trace Middle School, Kramer said he believes his cancer will help bring positivity to the lives of others. “God did allow this, but there’s a purpose behind it. It’s a way for me to say ‘I trust in him,’” Kramer said. Kramer’s younger brother, Caleb, a sophomore civil engineering major, said his brother’s disease has not weakened his leadership. “He’s definitely taught me to be more resilient and push through stuff and trust in God,” Caleb said. So far, Kramer has gone through four chemo treatments in the past month. With the side effects kicking in almost immediately after the three-hour sessions, he is often in pain or fatigued the week of his doctor visits. “Chemo treatment is pretty tough. I don’t even want to think about going back,” he said. Kramer said he feels encouraged that his form of cancer isn’t terminal and is highly treatable, but the process has been an eye-opener for the 28-year-old. “I never thought I would have cancer but when it comes, you have to face it,” he said. Kramer and Busch plan to create more awareness for Hodgkin’s disease by lending their support to other families dealing with it. Kramer is also lending his support to the Knights as they finish out a tumultuous season. “He still watches every game from the moment it starts to the moment it’s over, even when they’re losing,” Busch said. The moment he attended his first football game in 2009 had always left an impression even up until Homecoming, when he was up close and personal to the team that had changed his life. Watching the game from the most exclusive suite in the stadium, Kramer was sheltered from the sun, but a ray of hope beamed on the illness still trying to control his vigor.